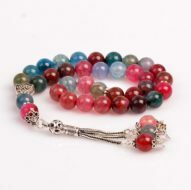 Hand Made, 100% PURE, REAL, Un-Treated, Very Rare, 33 Beads, beautiful and soothing, Guaranteed Turquoise gemstone prayer beads help you count your prayers and blessings, stay connected to the source and hold a peaceful, protective space around you. Use them in your daily practice or wear them as jewellery! 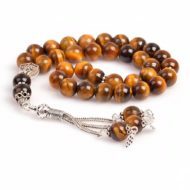 Our prayer beads are prized for the quality of our materials, the natural beauty and energy of our healing gemstones, and fine handcrafting. We use only top quality gemstone beads strung on 100% natural silk cord. 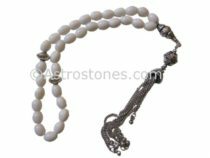 You’ll appreciate the rich benefits our prayer beads bring to your meditation practice. It is often called the “stone of health.” It promotes health, peace and inner calm and is worn for communication, luck and love. The Turquoise Gemstone has long been believed to be a magical stone that connects spiritual awareness and develops inner strength and calm. Turquoise has always been worn as a natural protection against the powers of darkness, even now it is used as the protective stone of pilots and aircrews and many other occupations deemed as high risk. It is generally accepted that turquoise gets its name from “Pierre turquoise” a French phrase meaning “Turkish stone.” Others believe that the name comes from the Persian word “fiouze,” meaning the colour turquoise. Ancient and yet always at the height of current fashion, turquoise was mined by early Egyptians as early as 6000 BC. For thousands of years, turquoise has been appreciated as a holy stone, talisman, and a good-luck charm. Apache Indians believed that turquoise gave warriors and hunters better aim and Zuni tribes believed that it protected them from demons. In Asia, turquoise was considered protection against the evil eye, while Tibetans carved turquoise into ritual objects. Wherever in the world it is worn and loved, turquoise is believed to promote prosperity and ideal for a person who wants to start a new business. The world over, wherever Turquoise is found, the local people all have the tradition that this sky blue stone is THE Master Healer. Turquoise is par excellence for spiritual attunement, healing emotions and balancing the auric bodies. It is great for relieving and dissipating sadness or grief. There is an uplifting quality as well as a calming quality to Turquoise. The Navajo and Hopi in Arizona value Turquoise as an attractor of prosperity and fertility of the soil. It is used all over as a great protector and provides strength during vision quests. In addition to being the Master Healer, Turquoise is treasured as a powerful success and good luck stone. Turquoise has been used for a long time, since before 4000 BC; Turquoise is believed to give the wearer clarity, calm and the ability to start something new. It also brings spoils to the warrior, animals to the hunter, and happiness and good fortune to all.